This mazurek is one my mother used to make. She used the peanut butter base for sernik as the base. This quantity of pastry is enough for a small tin – 26cm x 16cm. Leave the base to cool completely. The original recipe used a sweet orange jam/sauce which you made from sweet eating oranges. After a while my mother improvised and used English orange marmalade to which she added a little water and some sugar and heated this up for a few minutes. Use the orange/marmalade mixture whilst it is still slightly warm and pour this onto the base. 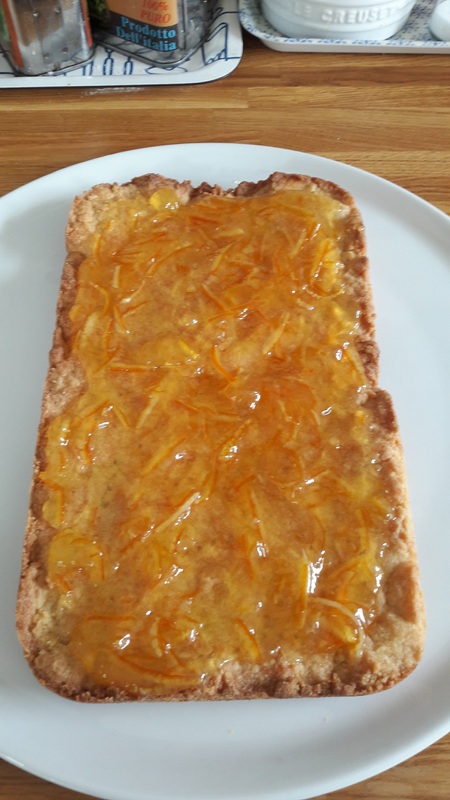 I have now found a jam from IKEA which is orange & elderflower , this has a really nice flavour – warm this slightly so it is easy to spread onto the base. You need 3-4 tablespoons of jam. Leave the orange jam to cool completely. Over the orange jam is then poured a chocolate topping. I have used the one from Mazurek – Using Yeast Dough yeast dough. Heat this on a low heat – stirring all the while. Allow to cool slightly and then pour this over the jam. Tea plates Las Palmas by Aynsley from the 1960s.